The Falcons returned to action this week and so has my coverage of them. Matt Ryan and Co. got back on track against a pretty terrible Bucs team. I want to read into it way too deeply and exclaim that WE’RE BACK, Y’ALL! But, unfortunately, everyone knows that’s idiotic in the truest sense of the term. 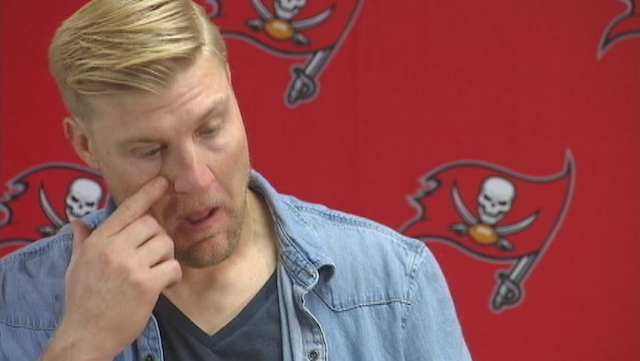 I’d cry too if I lost to this Falcons team… twice. Yes, I am wasting a whole point on this because I think it is so stupid. Why is he wearing red contacts? Is it because he is so miserably terrible that the only way he can gain a competitive advantage is by wearing something that looks incredibly stupid? I guarantee you it does not help him in any way other than making people think he looks ridiculous. He did put together his best game of the season and didn’t look completely lost out there for once. Yet that doesn’t change the fact that the contacts need to go. I was talking with Kyle of the College Football Roundup about what we need to do this offseason (Look forward to our joint post about the draft coming circa April). I came to the conclusion that we need to draft a pass-rusher in the first round (Vic Beasley or Shawn Oakman would be nice) and an Offensive Lineman in the second round. The next rounds are a bit of a toss-up, but I also think we should trade Roddy for picks. I love Roddy and would love to see him as a Falcon forever, but business is business and his glory days are over. We should capitalize on his value now and stock up for the future. HOW BOUT I ACTUALLY TALK ABOUT THE GAME? This was the most complete game put up by the Falcons thus far. I don’t count the first time we played Tampa Bay as a complete game because the other side clearly didn’t show up in that one. The receivers are starting to catch balls again (except you, DEVIN HESTER, c’mon man), the makeshift o-line is keeping Ryan upright just long enough (against a pretty substantial front 7 in Tampa Bay) and Even Steven Jackson is being the bruiser that he has been known to be for so long. I am looking forward to seeing how we do against Carolina this week as it will be a good indicator as to if we can actually make this run at a playoff spot that no one wants in the NFC South. Some big shake-ups have occurred over here at the playoff predictor. After running hours of code and looking at many metrics, this is where we stand. Newcomers: The Browns get propelled into the AFC North spot with a victory over the Bengals. The Chiefs quietly sneak into the last spot in the AFC. The Packers take the Cowboys’ spot after they look much more impressive. And none other than our very own Falcons–who are feeling good after being the only team that won a game in the NFC South this week–will take the division. Super Bowl Pick: The Patriots had a bye so it was very difficult for me to move them out of the top spot as no other team truly jumped forth to take their place. On the NFC side, the Cardinals lost Carson Palmer. And while I think they will continue their winning ways, I don’t think Stanton can lead this team to the Super Bowl and they will lose early. The Eagles can score points with anyone at quarterback, and they are flying high at the moment. So I’m giving them my pick. My pick: Eagles vs. Patriots. 2: A close second is the speedy John Brown making an incredible touchdown grab as he falls into the endzone. Also one of the best celebrations in recent memory. 1: An old friend stops by the Precap to show us what we’re missing out on. 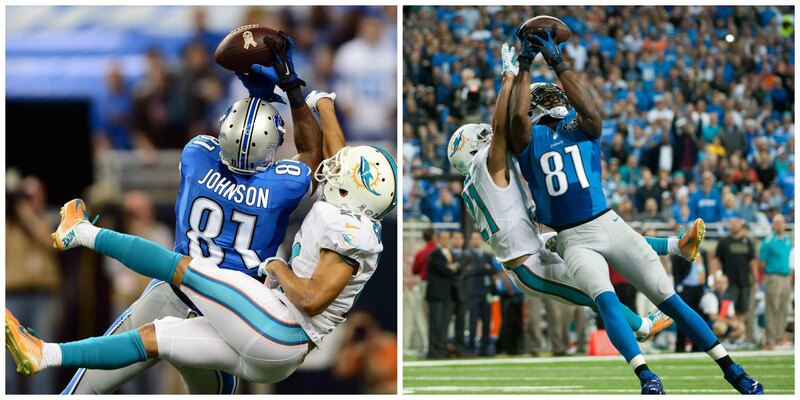 Optimus Grimes defeats Megatron in this battle. Megatron would go on win the war. BONUS GIFS: We’ve got bonus GIFs for days here in Week 11 of the Precap, including out first ever non-human highlight! And now to everyone’s favorite part of playing in London: the fans! 1. Do people in England think that the Cowboys are literal Cow Boys? 2. The dude in the sunglasses totally wasn’t prepared to be a part of this. He’s clearly got his costume on over his nice shirt and keeps looking at his friends to get cues at what he is supposed to be doing. Come prepared next time, mate. 3. The guy on the left is just happy to be in a cow suit. He could be at a ballet recital and doing the exact same thing and be just as content. 4. The NFL in London breeds true football fans. I mean, what else would lead you to purchase a straight-up generic NFL logo shirt? Watch as nature conquers man, then man befriends nature in this beautiful tale of love and sacrifice. GUYS. GUYS. GUYS. The Raiders are getting worse. And that means Marquette King heads into Jacksonville’s bye week only behind them by 3 punts. We will almost certainly take the lead this week and San Diego has the ability to force several punts. We are on pace for 98 at this point. WE CAN DO THIS, #KICKSQUAD! 1. Golden Tate out-gains Calvin Johnson FOUR YARDS AWAY, GOLDEN. C’MON MAN! 2. The Jaguars beat the Cowboys and hand them a losing streak Jaguars are never a safe bet. 3. The Falcons put up at least 30 points this week The week of almost getting things right…. Couldn’t let my boy get embarrassed in the GIF section and then not redeem himself. Oh gosh. these have become almost painful. 1. Ryan Mallett throws for 300 yards. 2. The Eagles and Packers combine for over 60 points. 3. The Falcons get at least 3 sacks against Carolina. The true contenders are beginning to emerge and it is fun to watch! I failed to mention earlier how much I think Ryan Mallett will be an incredible starter in this league. He’s the latest member of the Backup QB Mancrush Club. Look for him to throw like eleventy deep balls to Andre this year. Go Sports!